Punti Necessari: 5300 Please note that, for now, you cannot download content from our platform directly onto a mobile device (phone, iPod, iPad, tablets...). You need to download your items onto a PC or Mac, and then transfer them onto your device in the normal way. We are working on allowing direct downloads to mobile devices but this is not possible in the current version of the platform. Sorry about the inconvenience! NOTICE: Activation key must be used on a valid Steam account, requires internet connection. 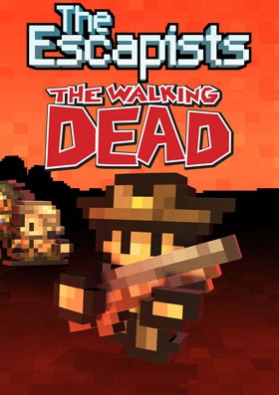 ABOUT THE GAME	Merging the award-winning, smash-hit, indie game The Escapists with the worldwide phenomenon that is The Walking Dead, comes The Escapists: The Walking Dead. In this unique game, recreated entirely in the charming 8-bit pixel art style of The Escapists, you play as Rick Grimes as he takes … on hordes of zombies let loose upon the world. Rick is in charge of a band of survivors featuring many of the original comic book cast, including Maggie, Hershel, Glenn and Michonne. Rick must secure the safety of the group by seeking out a safe escape route from each area, and manage several dangerous tasks to keep as many of the group alive as possible. The game faithfully matches the timeline of the comics, meaning Rick must first fight his way out of the Harrison Memorial Hospital, visit the Greene family farm before visiting destinations such as the Meriwether Correctional Facility and Woodbury. Protect the living and escape the dead as you play through the award-winning comic's epic story.KEY FEATURES 6 Locations: Tackle 6 of the most infamous locations from The Walking Dead story. Epic Crafting: Choose from over one hundred different items to make tools or fashion weapons to aid your survival. Well known characters: Interact with all your favourite characters from the comics and recruit them to help you with important tasks. Routines: Make sure you and your survivors keep up your daily routines - it's important for morale! Guns! : Firearms will now be available to craft or discover - they are handy for keeping walkers at bay! Zombie hordes: Use your wits and your survivor companions to fend off hordes of hungry zombies. Steam Achievements: Be sure to check every desk and room if you want to get them all! Steam Leaderboards: Optimise your plans and strategies to complete the levels in the fastest time. Cloud Saves: Take your game on the go to make sure you can get your fix.SYSTEM REQUIREMENTS Windows Minimum: OS: Windows Vista Processor: Dual Core CPU 2.5 gHz Memory: 2 GB RAM Graphics: Intel HD Graphics 4000, Nvidia GeForce 8000, ATI Radeon HD 4800 Series DirectX: Version 10 Hard Drive: 1 GB available space Sound Card: Windows Compatible Card Additional Notes: Note: In some instances, systems may require model specific drivers. If your system manufacturers no longer support hardware under this category, it may not be possible to run this title. Should this be the case, we are unable to assist you and recommend that you pursue support from your respective system manufacturer. Mac Minimum: OS: 10.8 Mountain Lion Processor: Dual Core CPU 2.5 gHz Memory: 2 GB RAM Graphics: Intel HD Graphics 4000 or higher, or Nvidia GeForce 640M or higher, or AMD Radeon HD 5750M Hard Drive: 1 GB available space	Linux	Minimum: OS: Ubuntu 12.04 64-bit or later Processor: Dual Core CPU 2.5 gHz Memory: 2 GB RAM Graphics: Intel HD Graphics 4000 or higher, or Nvidia GeForce 9800 GT or higher, or AMD Radeon HD 7850 Hard Drive: 1 GB available space The Escapists. © 2015. Published by Team17. Team17 are trademarks or registered trademarks of Team17 Digital Limited. THE WALKING DEAD is TM and © 2015 Robert Kirkman, LLC. Based on the Comic Book by Robert Kirkman, Tony Moore and Charlie Adlard. All other trademarks, copyrights and logos are property of their respective owners.